The 30th annual Oregon Asian Celebration has a sweetheart deal for Valentine’s Day (and the day after): 500 free tickets for UO students. The Oregon Community Credit Union is offering free tickets to the first 500 UO students who claim them; they can be picked up — or purchased — at any of their local branch locations before the celebration. Otherwise, tickets can be purchased at the fairgrounds on the day of: $6 for one day, $10 for both days and free for children 12 and under. While the UO has supported and sponsored the event throughout most of its 30-year history, this year marks the largest cross-campus effort ever to involve more students. The celebration also got a boost from an extensive collaboration with campus leaders, Eugene community members and event organizers. Interim UO President Scott Coltrane, along with Vice President for Equity and Inclusion Yvette Alex-Assensoh, will be taking the Atrium Stage at 11:30 a.m. Saturday to talk about higher education opportunities, including financial aid information and the admissions process. Additionally, student leaders and student services staff will speak about the Opportunities Program, Diversity Excellence Scholarship, student services and retention. UO advisers will have a booth in the Atrium for fairgoers to ask questions, pick up information and enter a drawing for prize giveaways. Other university organizations will have tables at both days of the festival as well, including the Center for Multicultural Academic Excellence, the Office of International Affairs, the Jordan Schnitzer Museum of Art, organizers from Cinema Pacific and the Confucius Institute. Each day of the festival will commence with a Chinese lion dance, signaling the start to a day full of traditional dances, cooking demonstrations, historical exhibits about Asian pioneers, cultural music, a noodle-eating contest, a photo booth, martial arts performances and a variety of food from across the Asian continent. The fair also features a 75-vendor marketplace and three stages. On Saturday, the UO International Cultural Service Program will provide music and dance demonstrations at 4:45 p.m. followed by a martial arts performance by the UO’s Wushu Club at 5:45 p.m.
Special appearances this year include Eugene Iron Chef Jeff Strom of the Koho Bistro, who will be preparing easy-to-make Indian, Korean and sushi dishes, the Cloud City Garrison stormtroopers — a film-authentic Star Wars costume club — and exotic animals from the Zany Zoo. The Asian Celebration is also partnering with the Lane County Historical Museum, which is next door to the event center on the fairgrounds. Visitors to the festival can visit the museum free throughout the weekend by showing their admission hand stamp. Currently on display at the museum is an exhibit chronicling the struggles of the Japanese-American Nisei soldiers, titled “What if Heroes Were Not Welcome Home,” along with educational information about Executive Order 9066, which allowed Japanese internment around World War II. 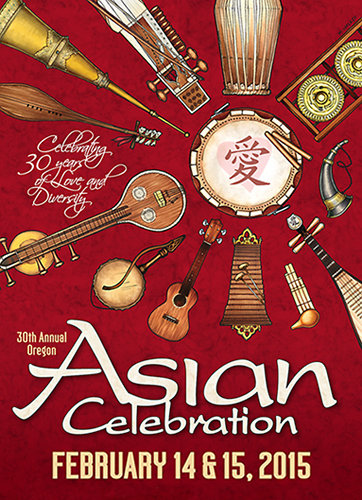 The 30th annual Asian Celebration is produced by the Eugene/Springfield Asian Council with sponsorship support from Oregon Community Credit union, University of Oregon, Kikkoman USA, McDonald’s Restaurants, International Imagination Inc. and KVAL-TV.